Iranian leaders, including the supreme leader Ayatollah Ali Khamenei , recently expressed their condolences  to Hezbullah's  chief Hassan Nasrallah, after the killing of Imad Mughniyeh , one of the militant group's top commanders, hailing him as a “great man”. Mughniyeh was featured on President Bush's “top 22 most wanted terrorists” list of October 2001 and he was on the FBI's most wanted list. He was alleged to be behind the 1983 US marines barracks bombing in Beirut  which claimed the lives of 241 marines. Islamist bloggers in Iran have shared their ideas about Mughniyeh or “Haj [Hajji] Rezvan”  as they call him. They also published some very rare photos of him. I was in the street when I received an SMS telling me that Mughnieh had been assassinated. I froze in the middle of street. 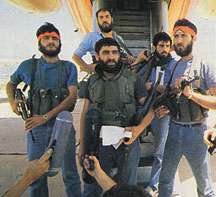 Emad Mughnieh was also called Haj Rezavan. I forwarded the SMS to my friends and 90 per cent asked me who he was. He was a super Mujahed of the Islamic world. This [assassination] was the end of one of Ruhollha's [Ayatollah Khomeini , the Islamic Republic's founder] children. It would have been a pity if his life ended any other way. On Sajed's site, we read  that in the near future a stamp to honor Haj Rezvan will be published in Iran. “The Cultural Foundation for the Holy Defense of Khormshahr ” says this stamp will be published in a series depicting the Khormshah defense and South Lebanon resistance. 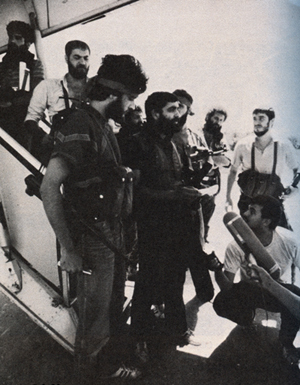 Khoramshahr was a symbol of resistance during the Iran-Iraq war  for many Iranians. Bachehayeh ghalam (means “children of the pen”) says  [Fa] Mughniyeh understood the message of Shi'ism  and was against injustice and oppression. The Muslim Bloggers Association say  that thanks to Mughniyeh’s blood, now thousands like him will be ready to fight against oppressors and become martyrs. They have created a logo for Mughniyeh where they congratulate him for his martyrdom.